Fig. 2 Example of competitive PCR assay. 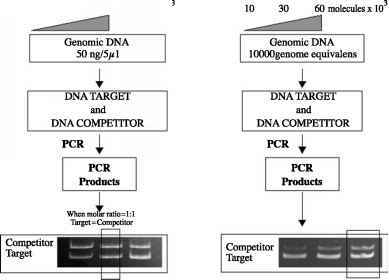 The assay is performed in two-step (A and B) competitive PCR. In step A, the exact DNA concentration of each samples is accurately measured by reference to a single copy reference gene (i.e., b-globin), while in step B, the exact number of target gene copies was determined. In both PCR steps, we added three dilutions of DNA competitor (single copy reference gene competitor or target gene competitor). The competitor/genomic ratio was evaluated after acrylamide gel electrophoresis of PCR products.